The capital of the Badami Chalukyas from 540 AD to 757 AD, Badami was known by the mythological name Vatapi. After the establishment of the Chalukya Empire in 500 AD, the Chalukya King Pulakeshi built a fort at Vatapi and made it the kingdom’s prized capital. The city is famous for its several archeological monuments that the Badami Chalukyas built. Most buildings exemplify the distinctive Dravidian architectural styles. The city came under the reign of the various kingdoms and dynasties like the Vijaynagar Empire, Adil Shahi Dynasty, Mughals, Marathas, Mysore Kingdom and the British. 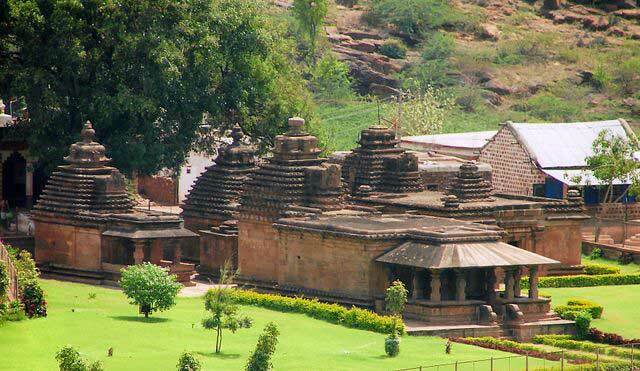 Here’s the list of the best places you can visit in Badami. The temples were created by the Badami Chalukyas in the 6th and the 7th centuries. 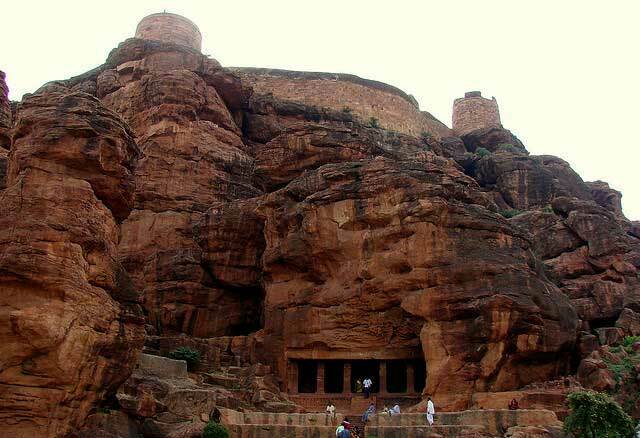 Badami cave temples were carved from a massive sandstone cliff located in the city. The sandstone from the cliff was perfect for carving, and the cave temples are marvelous examples of the Badami Chalukya architecture. The temples are located between a ravines surrounded by huge cliffs. The architecture is a fine cross between Nagara (north Indian) and the Dravidian (south Indian). The temples are built in soft sandstone famous in this region and were built by the Badami Chalukyas between the 7th and the 11th centuries AD. The group of shrines is dedicated to the Hindu deity Bhutanatha which is another name for Lord Shiva. The temple complex is a prized specimen of the marvelous Badami Chalukya architecture which was a blend of the north Indian and south Indian styles. The various stone sculptures and stone carved structures will make you spellbound for sure. The Mallikarjuna Group of Temples is located right near the Bhutanatha Group of Temples. The temples display a different style of architecture which is the reason for the pyramidal shape of the buildings. The temples were built in the 11th century by the Badami Chalukyas. While the ancient fort built by the Chalukya King Pulakeshi in 543 AD is in ruins, it is still a must visit due to the quaint nature of the surroundings and the fort’s location. 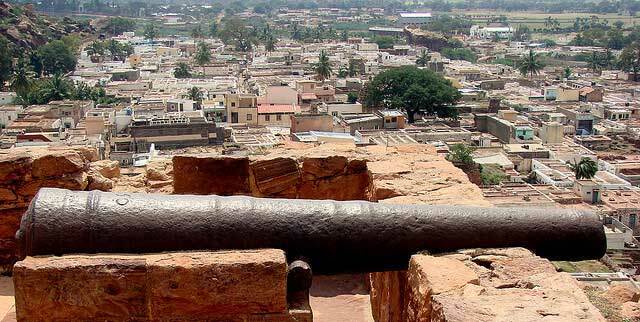 The fort was ransacked and destroyed by the Pallavas in 642 AD. The fort walls and a gate are the only remnants of the once marvelous architecture. Malegitti Temple is dedicated to Lord Shiva the Temple is built above the Badami fort and overlooks the beautiful Agastya Lake. This temple is the oldest in Badami and was built during the 6th century AD. The views from the temple are marvelous and must be visited. 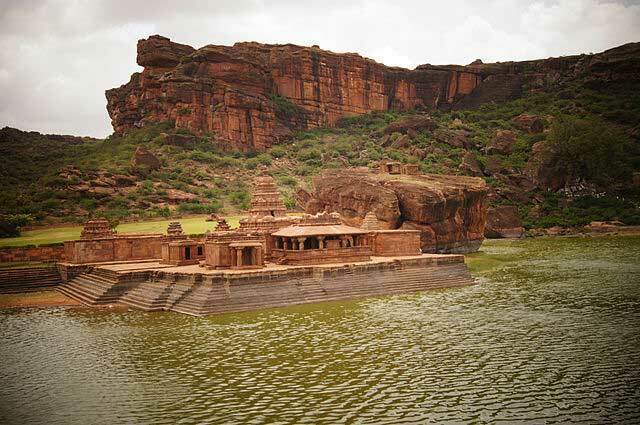 The once blooming and majestic capital of the Chalukya Kingdom, Badami is now a great tourist attraction in Karnataka. The various archeological findings and monuments that date back to the era of the Majestic kingdom are a must visit. Hey, I know that you are a North Indian writing some history articles of South India. Please spell and write correctly as CHALUKYA (as in Kannada) and not ChalukyaN (as in Tamil). Learn to know the difference and write correctly!! Thanks bro. Great job ! Of-course someone’s spelling can be taught its not a big deal but the feeling of south/north etc things need to unlearn. Dear Mahadeva your name means a lot but your words don’t seem good, You improve first yourself then give lesson to others. He could have put it in a better less rude way. Instead of dragging south/north thing here. Which was unnecessary. I completely agree with Pradeep.